The red bat ranges in color from orange to a rusty brownish-red color but the males have a tendency to be a darker rusty color than the females. Their fur has a white frosting to the tips on their backs and chests. Their wing membranes are mostly blackish in color which give these bats a beautiful contrast. They are also one of the larger bat species as they reach lengths of almost 5 inches long with a wingspan of 13 inches. The red bat is a widespread species that is found across most of North America. Their range includes southern Canada, all the way down through Central America and into northern South America. The only places they are not found are in the Rocky Mountains and in southern Florida. They are a common species of Kentucky, most frequently in the summer, but they are known to travel through Kentucky during their migration in the fall. 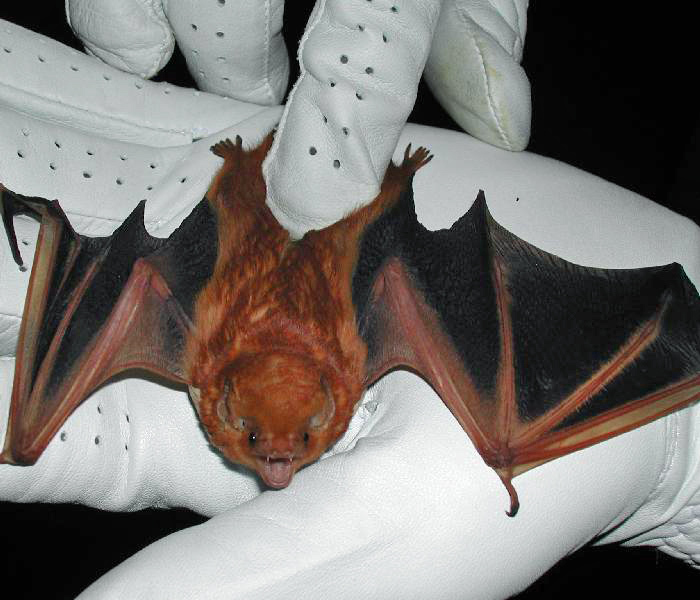 Most red bats are known to migrate south to avoid the cold weather of their northern range. There are some who will spend their winters in Kentucky due to the milder winter weather and these individuals with hibernate in hollow trees, fallen logs, and in the leaf litter of the forest floor. They are rarely if ever, observed roosting in caves although they have been seen swarming with other species at the mouth of caves. They are forest-dwelling bats that roost in leaf clusters in trees where they will hang from one foot and blend into the dead leaves of trees. Red bats are a solitary bat species that do not form any sort of grouping or colonies. They forage on a lot of different insects like moths, flies, true bugs, and even crickets. They mate prior to their hibernation period and the females delay fertilization until the spring when there is abundant food. They will give birth to a litter of pups that will range in size from one to four pups from late May to early June.